Abstract: The Silent Knight II heatsink is almost entirely made of copper, the base and fins and heatpipes all utilize this thermally conductive metal. Asus is such a well known computer brand that it's not surprising the company is expanding into thermal solutions, though sometimes we think this area is better left to dedicated firms. Asus has released a handful of heatsinks each year since it began selling Asus-branded thermal solutions, and Frostytech has already tested a half dozen of these models. The results have been mixed, and thus far the Asus name doesn't immediately equate to a given performance standard in the world of heatsinks. With established thermal solutions brands like Arctic Cooling, Zalman and Thermalright, you generally get back what you expect. Asus have some good heatsinks, the Triton 77 comes to mind, but you need to do a little research before committing to a purchase. In this review Frostytech is evaluating the ASUS Silent Knight II heatsink. 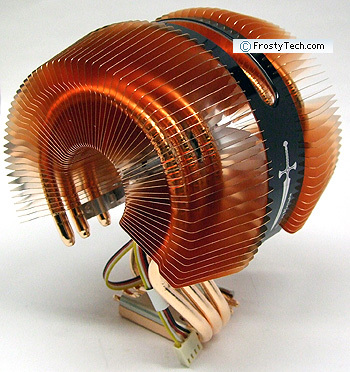 The Silent Knight II is a copper heatsink vaguely reminiscent of the Zalman CNPS9700NT. Like most thermal solutions being introduced, it's compatible with Intel Core 2 Duo/Quad/Extreme and AMD Athlon64 processors. A 92mm PWM fan is set within the body of the heatsink and spins at 800-2300RPM, generating no more than 46 dBA in Frostytech's real world measurements. A pair of blue LEDs illuminate the translucent impeller blades, giving the Silent Knight II a nice visual effect. 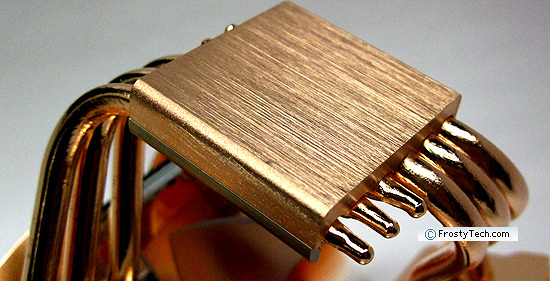 The heatsink itself is almost entirely made of copper, the base and fins and heatpipes all utilize this thermally conductive metal. Six copper heatpipes wind around in a semi-circle from the base to support a donut of copper cooling fins that wrap around the inset fan, so clearly Asus are aiming for low noise operation over sheer performance. The heatsink weighs 610 grams and runs about $70USD. Accompanying the Asus Silent Knight II heatsink is a mountain of brackets so it can be installed on Intel or AMD processors. In both situations the user must remove the motherboard to install a specialized back plate and upper metal retention frame. It's complicated and a little unwieldy, and it would be unnecessary if an appropriate clip had just been designed that fit over the top of Asus Silent Knight II's base. The AMD bracket is compatible with socket 754/939/940/AM2/AM2+ processors, the Intel bracket with LGA775. 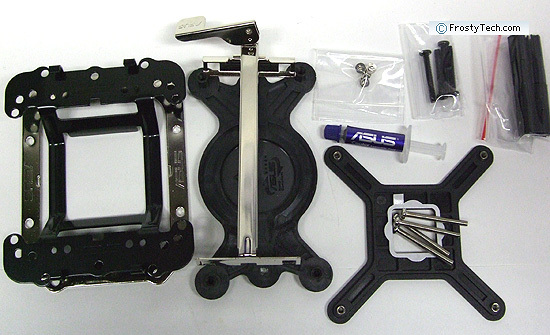 Once installed the Asus Silent Knight II fits into the center of a metal frame, and a K8-like bracket clamps down on the base of the cooler to apply clamping pressure. 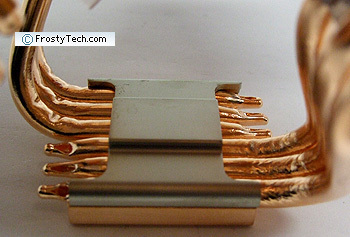 The copper base of the Asus Silent Knight II heatsink has a brushed surface texture, with a surface roughness of about ~32 microinches, which is considered good. It is generally quite flat in both axis.